Steve is Team Ledgestone's pro master extraordinaire. 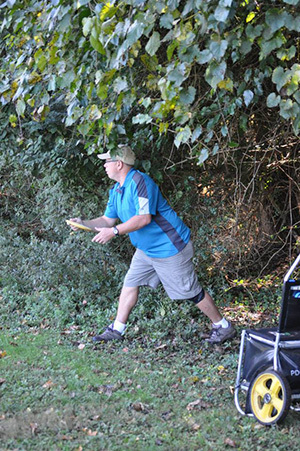 Steve is very involved in the Indiana disc golf scene and volunteers as the state coordinator. Steve throws it a country mile and relies mostly on his backhand. Steve looks forward to participating, representing and growing physically and mentally as a person of faith in the disc golf community. Steve and his wonderful wife Jennifer live in Indinanapolis. Boss, Xcaliber, Max, Roc, Cobra, Thunderbird, Gator, Deadalus, Wraith, Monster, XD and RPro Rynos. Be patient and get a mentor. It's a game and a sport, so sportsmanship and integrity are vitally important to the growth of the sport.